It's green tomato glut time! During the last few late-autumn weeks, we have watched the last tomato blossoms swell into green globes--hard, smooth, shiny, and decidedly not destined for a salad-- since they will not ripen before the hard freezes come. 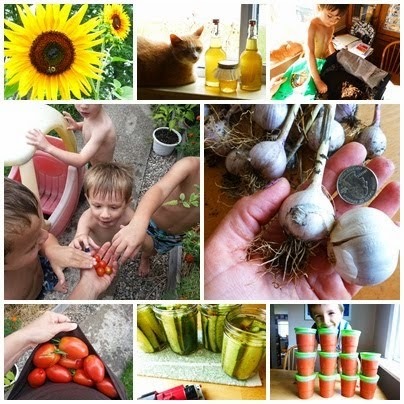 If you cleaned out your garden and have a big bunch of green tomatoes on your hands, you can try to ripen up some of your harvest, but you'll inevitably be left with at least a few that simply won't turn. I'm amazed by the amount of creativity that goes into using up the last of those green summer tomatoes. The internet is filled with relishes, salsas, soups, chutneys, pickles. Of course there's the infamous fried green tomatoes, which I have never personally tried *ducks--I know, I know! There are even pies and cobblers with green tomatoes filling in--and on that sweet note, I learned that green tomatoes can be made into jam (but really, can't just about anything be made into jam?). Being the big jam family that we are, I decided I must try it. The result? Definitely GREEN, definitely not what one expects from jam, yet incredibly good. Having three sons, the 'weird green' factor is actually a good thing. We love this new concoction! I combined a couple of recipes to come up with this one, and it is unbelievably tasty. Like, oh my gosh, someone-take-this-spoon-away-from-me delicious. I had serious doubts about making green tomato jam, but I'm so excited about how it turned out. Whether spread on a pb&j sandwich, or on toasted homemade bread with butter, or swirled into plain yogurt (which I tried immediately and loved), this jam will be an awesome addition to your homemade jam repertoire. 1. Remove stems from tomatoes and cut out any bad spots. Roughly chop the tomatoes and then pulse in a food processor or blender until you get the consistency you like. Process the tomatoes in small batches, pouring them into a heavy-bottomed 4 quart pot as you go. 2. Once all the tomatoes are pureed to your liking and in the pot, zest and juice the lemon. Skin and mince the ginger (I pulsed it in the food processor a few times, scraping down the sides to make sure it was all minced). Add the sugar, lemon zest and juice, minced ginger, and cinnamon stick to the pot and bring to a boil over high heat, stirring well. 3. Let the mixture boil for 20-40 minutes, depending on the thickness you want for the finished jam. Remove the cinnamon stick after 10 or 15 minutes, and continue to boil, adjusting heat to avoid too much splattering from the hot tomatoes. Stir often. 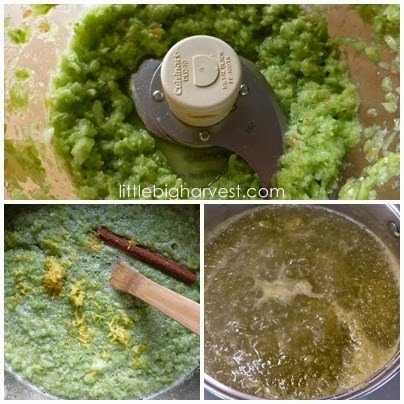 The jam will thicken and become darker green the longer you cook it, so this is where your preference comes into play. 4. Once the jam has thickened, place into sterilized jars. Wipe the rims, place lids and rings on the jars, and process in a boiling water bath (water covering jars by at least one inch) for 10 minutes. Remove from water bath and let sit on a towel on the counter overnight. If any jars didn't seal, put those in the refrigerator and eat first. The sealed jars will keep for a year. Makes about 7 half-pints (with a little extra to eat right away, which you will want to do! Just make sure someone is around to pry that spoon out of your hands before you get too crazy). If you have a favorite way to use green tomatoes, be sure to comment, and leave a link if you have one! LOVE this! :) I'm going to have to try it next season. We already used up all our green tomatoes this year.. wish we had some left to try this! What a good idea! I already used the green tomatoes I had. I made "fried" (baked) green tomatoes and put them on BLTs, it was super good!